It is early on Sunday morning, and we're out for a walk in the cool air. James is flanked by his cuddle toys, and I'm working up a sweat pushing the stroller quickly along the road. I'm headed to buy a coffee at the Tim Hortons in the gas station at the corner of the main road. I'm in the gas station, paying for the coffee and for a donut. I turn to the man and say '1 large coffee, 1 donut, and 1 medium-sized baby.' He is charging me for the coffee only, and winks at me, saying the donut is a gift for the baby. Happy, I stroll along the roads back on my way into the park. A loud float plane is buzzing over head. It is on its way to float somewhere. I wish I was in it, with my camping gear and a fishing rod. From the corner of my eye, I spy an Annual Cicada (Tibicen linnei) sitting in a cold corner of the sidewalk. I put it on a stick and take a few photos, before returning it to a more shelter and safe place. Birds like to eat cicadas. They sit patiently underground for 13 years, and emerge to moult from their carapaces. They fly about a little, mate and then become a meal for something larger. Their honey-coloured menacing carapaces remain affixed to bark. A slit down the back tells us that something emerged earlier. 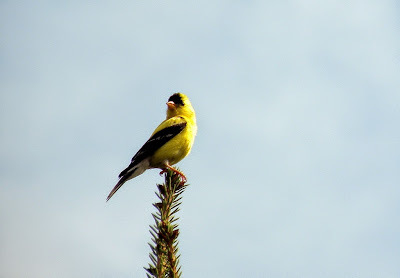 An American Goldfinch (Carduelis tristis) sits at the top of a spruce tree in the park (thanks Saxaphonium). Whistling, tweeting, this American Goldfinch is small and pretty. James can't see it from his stroller, but is furiously giggling at me because I'm making funny faces. I am good at making funny faces.